It was less than a month ago when the Bush Administration basically clarified the UIGEA bill and it will go into effect only a couple days before the Bush Administration leaves office. Well now the Poker Players Alliance is trying to get a head start on trying to convince the Obama Administration to do something about the flaws with UIGEA. 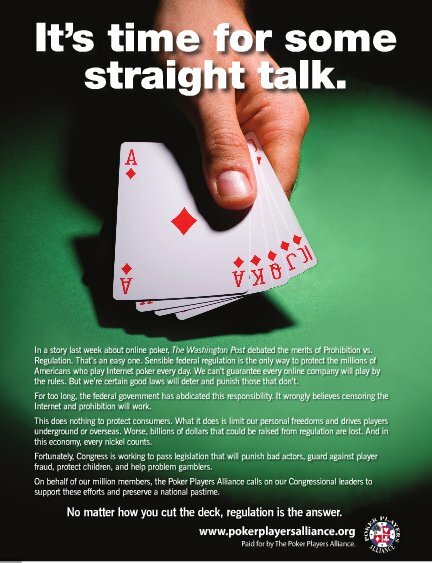 What the Poker Players Alliance did was take out an advertisement spot in three of the most read newspapers by policy makers in Washington D.C. The Poker Players Alliance purchased some ad space in three newspapers in Washington D.C. the other day and those papers were “The Hill”, “The Politico” and “Roll Call”. What the Poker Players Alliance is trying to achieve with these advertisements is to try and convince the government that online poker needs to be regulated and not banned. The Poker Players Alliance is calling it a generalized call to “Sensible Federal Regulation”. These advertisements come in the wake of the “60 Minutes” segment that featured the online poker cheating that was going on at Ultimate Bet and Absolute Poker, which showed that the government needed to step in and regulate this booming business to help protect the consumers from any kind of cheating from happening again. Below is the ad that was placed in the three newspapers in Washington D.C. Any news that comes from these efforts, we will be first to let you know.